World Vision was founded in 1950 by Bob Pierce in response to the needs of Korean War orphans. It has grown into one of the largest Christian relief and development organizations, working with a staff of 23,000 in almost 100 nations. World Vision maintains its historical focus on children, and helps their families and communities not only by supplying immediate needs but also by tackling the causes of poverty and injustice. 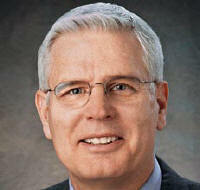 We spoke with Richard Stearns, President of World Vision U.S., about his work. Christian Odyssey: World Vision is an effective and influential organization. How did you come to be president of its U.S. operations? Richard Stearns: My story meshes with one in Scripture, the story of the rich young ruler (Matthew 19:16-22). Let me tell you that one first. It starts with a question — a man came up to Jesus and asked, “Teacher, what good thing must I do to get eternal life?” I see here a man who is a bit cocky and full of himself — looking for a public pat on the back from Jesus. CO: And how does that story connect with you? RS: Nine years ago I was the CEO of the fine tableware company, Lenox, a half-a-billion dollar enterprise with 4,000 employees. My salary and bonuses were almost a million dollars a year. Like this young man from Scripture, I was prosperous, a leader in my church, respected in my community. I held degrees from two Ivy League universities. I was happily married with five beautiful children. We lived in a ten-bedroom house on five acres outside of Philadelphia. I was a model church-going Christian — a poster boy for successful Christian living. But then I had an experience very much like that of the rich young man that shattered my world. Through a series of amazing events, none of which were of my doing, I was asked to serve as president of World Vision. I was confronted with a stark choice — quit my job, the one I had worked for more than 20 years to attain, take a huge pay cut, sell my house — move my family almost 3,000 miles to a place where we knew no one, and accept a job I didn’t want — with a strong likelihood that I would fail and find myself unemployed a year later. This was the first time in my life that I truly understood the commitment that God wanted me to make as a follower of Christ. After great anguish and with a heavy heart, I finally accepted that call in June 1998. In July the moving vans pulled up in front of our home to move us to Washington State. And in August I found myself in Uganda in the midst of the AIDS pandemic. CO: Some people might think that Jesus was talking to that particular man about his particular problem, and we have different problems. What makes you think that Jesus was talking to you? The question that hangs over all of us 2,000 years later is this: How are we to embrace this mission of Christ in our world? Should not our mission be the same as that of Jesus? CO: Many conservative Christians put a low priority on helping the poor, on trying to change this messed-up world. Isn’t it reasonable for churches to focus on the gospel and to let humanitarian work be done by organizations like World Vision? RS: Organizations can help, but I don’t think we can separate the mission of Jesus into separate spheres. The Bible tells us that the Lord is disgusted with religion that is empty and devoid of deeds. God expects not just belief, but also action motivated by our belief. James tells us that true religion means that we should care about people, about orphans and widows. It’s not enough to listen to the word — we should also do what it says (James 1:22, 27). I’m sick of your religion, religion, religion, while you go right on sinning. When you put on your next prayer-performance, I’ll be looking the other way. No matter how long or loud or often you pray, I’ll not be listening…. Say no to wrong. Learn to do good. Work for justice. Help the down-and-out. Stand up for the homeless. Go to bat for the defenseless. (Isaiah 1:13-17). God wants his people to care for the poor and stand up for justice. We can’t just talk about the gospel — we have to demonstrate it, too. God didn’t just love the world — he loved it so much that he did something about it—he sent his Son. Our love for the world cannot be passive, and it can’t be limited to the institutional level. It must also be personal. To me, the most sobering of all Jesus’ recorded words are these: “Why do you call me, ‘Lord, Lord,’ and do not do what I say?” (Luke 6:46). How could I call him Lord, and not be willing to do what he asked? CO: You were offered an unusual opportunity. The average person obviously cannot just drop everything like that. In practical terms, what can the average Christian do to share in that aspect of Jesus’ work to alleviate suffering and poverty? RS: Certainly, not everyone should quit their job and join a humanitarian or mission organization. The Body has many parts, and those members working in other places can do their part. However, none of us is exempt from caring about the poor and oppressed. Almost 3 million people have chosen to sponsor a child through World Vision, believing that they can’t eliminate poverty altogether, but they can help one child. Others can volunteer at a soup kitchen or other local charity with a ministry to the poor. All of us can hold our elected officials accountable for just and compassionate foreign assistance policies. CO: Poverty and the problems caused by ignorance seem overwhelming. But some people have suggested that if we really put our minds and resources to work, the major problems could be resolved in as little as 25 years. Is that really an attainable goal? 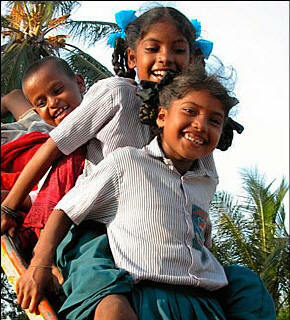 If not, what do you see as attainable goals for World Vision, and those who support you, for the near future?